Apple hasn't said much publicly about its foray into autonomous driving technology, but it's hard to keep a self-driving car hidden on the road - and a MacRumors reader has spotted a significantly upgraded setup doing the rounds in sunny California on top of a Lexus SUV. If you're new to the saga of Apple's self-driving cars, the general consensus is that Apple was working on a vehicle of its own before scrapping that idea last year. Now Apple is focusing on the technology and the AI that goes into making cars autonomous, rather than making an actual motor. It still needs cars to test out though, which is why you can spot Apple engineers tootling around the streets of California in adapted Lexus SUVs. In this particular case the vehicle was spotted outside one of Apple's offices. The car appears to be fitted with a whole stack of extra LiDAR equipment on top - that's the "Light Detection And Ranging" tech that uses lasers to map out a 3D picture of the nearby environment, something that's pretty essential if you want your car to automatically avoid any obstacles in its path. According to AppleInsider, what you can see in the pictures are 14 Puck LiDAR sensors, each capable of logging 300,000 data points per second at a distance of up to 100 meters. Also spotted in the photos are GPS, radar, and radio equipment, making this one of the most tricked-out self-driving cars yet. 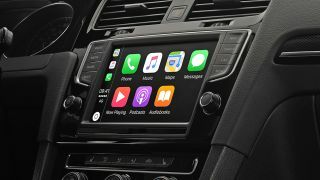 It would seem that Apple's in this for the long haul, though we're still no closer to knowing when we'll be able to let Apple software take the wheel of our own cars (carOS?). One recent rumor suggests the tech will appear first in autonomous shuttles designed to take Apple staff around the company's new headquarters.